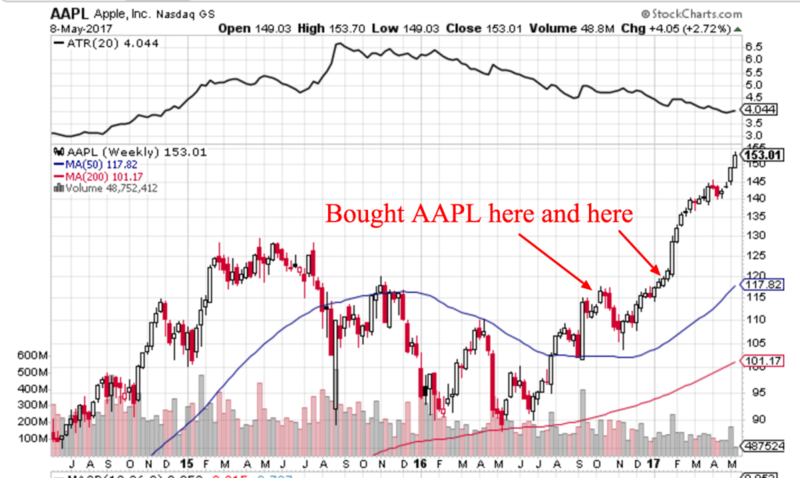 Are you looking to make smarter trading decisions using weekly stock charts? Because if so, you’ve come to the right place! In this detailed blog post I want to show you my favourite tips, online tools, and free apps you can use to start surfing weekly charts and streamline your trading workflows right now! Trading from weekly charts makes it much easier to catch BIG market moves. And these massive week or month long trends can really have a positive impact on your bottom-line profits! 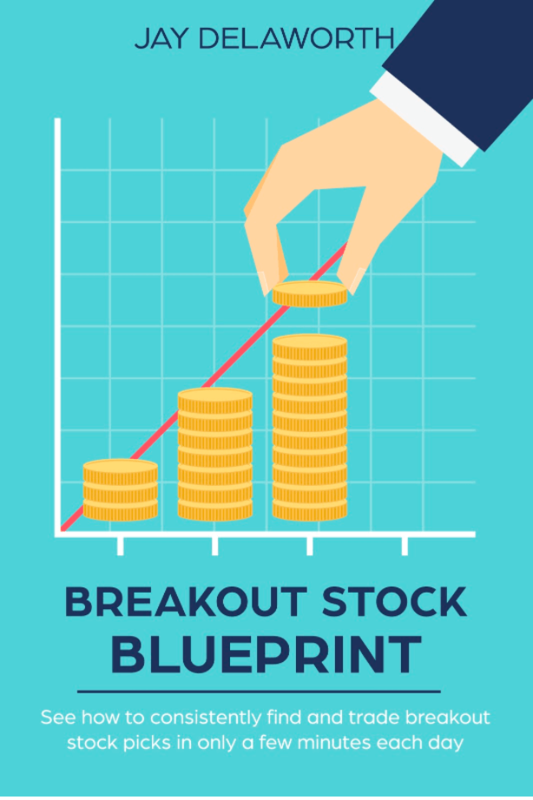 By the way: This article is packed with over 2,500 words of actionable info to help you make the most of weekly stock charts. But if you want: You can request a PDF copy for easier reading here! Trading with weekly charts also smooths out most of the random noise you see on shorter timeframe charts. It can really improve the signal-to-noise ratio of your technical analysis and help you stay with the big trends longer while worrying less. So in this extremely detailed article, I want to help you understand all the pros and cons of weekly charts and how you can use them yourself. Where you can find free weekly chart trading tools to use online and on your phone! 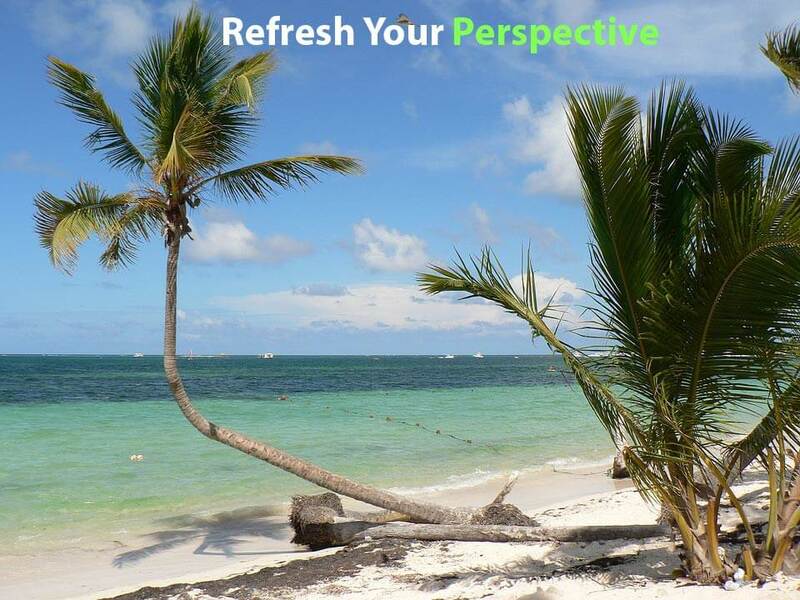 And by the way, even if you’re a short term day trader or swing trader, you can still drastically improve your trading … (and your confidence)… by taking a minute to look at the big picture perspective weekly charts provide! Just as I explained in my recent article about trend following with monthly charts, by zooming out before placing your trade, you can give yourself an advantage that most other short term traders are missing. By seeing the bigger picture, you can better identify the major trend (using something like the slope of a 30-week moving average) in order to align yourself with the line of least resistance. Now… while this sounds good in theory, let’s get into the details of trend following with weekly charts so you can improve your odds of stock market success. Sound good? I find it shocking how few day traders and swing traders ever glance at weekly charts. While I do use weekly charts quite actively for position trading, I think the majority of new traders out there underestimate the value of these charts. I understand how you can get bogged down in 5-minute candlesticks and 30-minute trend lines. Taking a quick look at the weekly charts can be critical to your long term stock market success. This long-term view can help you easily identify the major trend that’s playing out in the specific stock, (or market), you’re thinking of investing in. 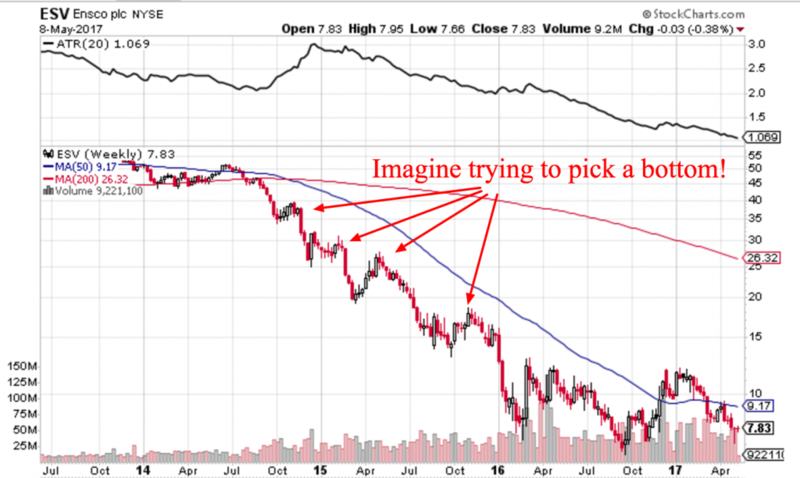 The famous trader Jesse Livermore used to call this the line of least resistance. And I think that sums it up perfectly! Again… even as a short-term trader… don’t you want the odds in your favour like this? 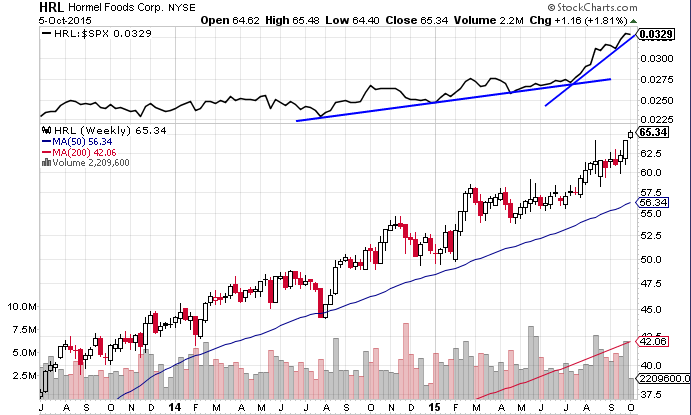 Would you really want to go short a stock that is in a strong multi-week uptrend? Can you see how the weekly chart would inform your short-term trading bias? In strong uptrends like this, shorting ain’t easy. On the other hand, going long during market corrections doesn’t work either. The beauty of these weekly charts is that you get a great view of the major trend. It’s easier to see where the big money is positioning. I find this weekly view to be much smoother than daily charts because the weekly candlesticks reduce the day-to-day volatility. In my experience, this can help you stay focused on the longer-term trajectory of a company and less likely to get your stops hit prematurely. When you know where a stock has come from, you can get a better sense of where it’s going to go! And it doesn’t just work for uptrends! Looking at weekly charts can also help you avoid buying beaten down stocks in downtrends that are likely to keep going lower. Using weekly charts to act as a trend filter is especially helpful for value investors and contrarians who are eager to catch falling knives. Or maybe you call them cigar-butts, or 50-cent dollars. By simply avoiding stocks in VERY steep downtrends, you can better put the odds in your favour. Bottoming takes time. Why not let the trend take shape before putting money at risk? … But how do I know this? As you might have guessed, it’s because for me personally… I started my stock market career as a value investor, looking for under-priced investment ideas. Unfortunately, this often resulted in finding stocks at 52-week lows, and waiting for them to turn around. It was no fun at all to buy losing stock picks and watch them wallow at new lows. Unfortunately, more often than not I was disappointed. If only I had been able to look at the weekly chart below with clear eyes! No matter how undervalued a company is, would you really want to own it when it’s in a downtrend like that? 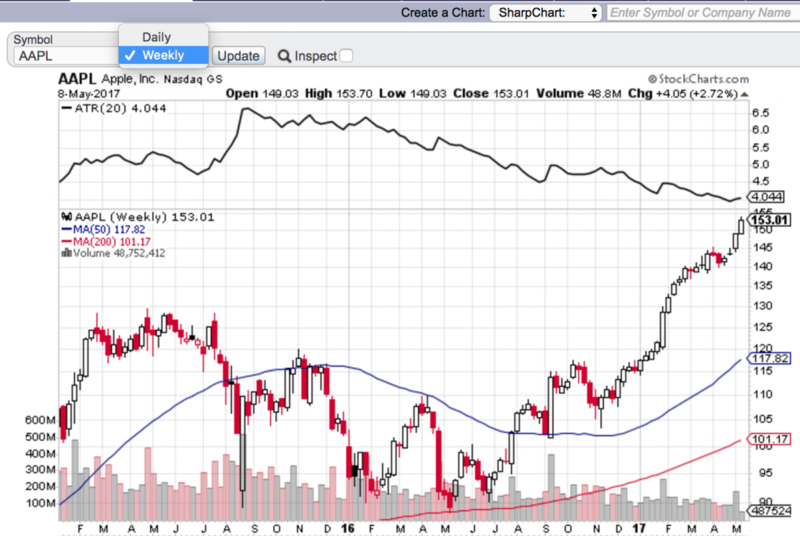 I eventually started using weekly charts to help me focus on quality companies that were undervalued AND starting to trend upwards on a weekly basis. That’s actually how Intelligent Trend Following as a concept was born. And you know what? This technique alone dramatically improved my results (and my peace of mind)! It also sped up my investment decision-making process so that managing my portfolio went from hours a day… to… under 30 minutes per day! Instead of pulling my hair out wondering when a company would turn around, I just let the charts be my guide. Of course it wasn’t perfect, and I still had some details to work out. But timing my trades with weekly charts quickly started making a big difference for my investment decisions. Pretty simple when you think about it, right? Right. Just try to keep it top of mind if you’re ever bottom fishing. Now, I hope you’re starting to see the value in weekly charts and why they might appeal to you whether you’re an investor or trader. So let me show you some of the other great things you can use weekly charts for too! Trading with weekly charts isn’t just about finding big uptrends and avoiding downtrends (although that’s definitely part of it). You can also use weekly charts to find massive charts patterns that could portend even bigger breakouts! With weekly charts, you can easily see if a stock has been hitting up against resistance for months, quarters, or even years on end. When these long-term breakouts eventually do happen, the weekly charts are the easiest place to see them! On a daily chart, you might not see the bigger picture. But with a weekly view, the size of the potential breakout becomes more clear. These charts usually span multiple years, so the technical pictureis meaningful. 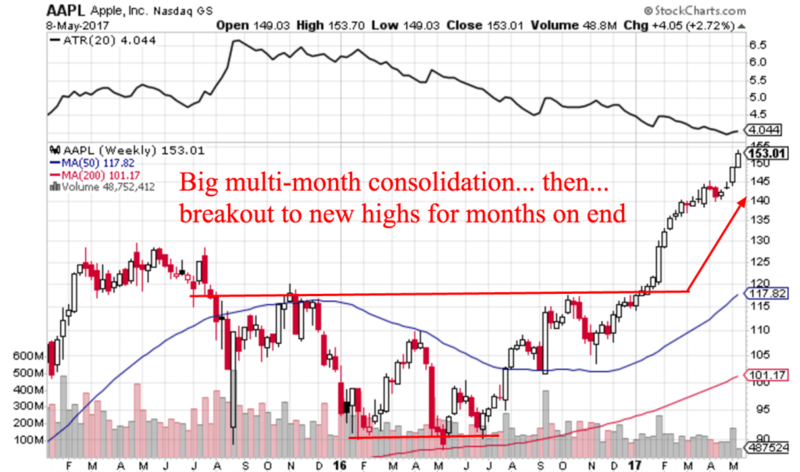 These are typically stocks that are consolidating for months (or even years!) before they eventually pop. Of course, not every pick is a winner. But if you can manage to catch a few big trends like this each year… well… then you can really start to get some traction in your account. Because a few big winners will pay for many small losses… and more! By coming up with a trading system that incorporates this bigger picture weekly view, you can make your life much easier. It’s almost like top-down trading, but using time instead of markets and sectors to help inform your decision-making. So… if you’ve even a little bit active with your stocks (either as an investor or a trader).. I recommend you think about the different ways you can incorporate weekly stock charts into your trading and analysis process. Investors: Can use long-term weekly charts to help time their entries and exits based on how changing trends align with their value/price targets. Traders: Can use simple indicators on weekly charts (like a 30-week moving average) to determine the longer-term trend and help inform their short-term trading plan to go with the line of least resistance. Of course we can get into more details. But there’s another huge benefit to trading weekly charts I’d also like to share with you. So keep reading to find out what it is! By now, I hope you’re starting to see the important role weekly charts can play in your trading analysis. They provide a unique perspective that’s both actionable and full of context. You can easily grasp how they help you identify the major trend to inform your bullish or bearish bias on shorter time frames. And you can also see how weekly charts smooth out the signal to noise ratio and short term volatility. But let me tell you my favourite thing about weekly stock charts. The biggest benefit of trading from weekly stock charts is that you end up placing smaller position sizes and wider stops. The implications are big. As I’ve said before, overtrading is one of the WORST mistakes traders make. Especially new traders (who tend to think more trading activity leads to accomplishment). But the truth is you typically need to sit in a stock to wait for the price moves. It’s not often talked about. But over trading is responsible for chopping up the brokerage accounts of countless traders. Because between commission costs and slippage, over-trading can erode your bottom line before you’ve even realized what happened! The endless decision-making can be tiring and lead to emotional burnout… which… can lead to even more mistakes! Sound familiar? I’ve been there and done that too. But that’s why I love weekly charts! They really help you take a step back and avoid getting in your own way. Just trade patiently and let your system do it’s thing. Where’s the Best Place to Find Weekly Stock Charts? While your broker probably provides a charting function with weekly charts, my favourite free online tool to use is StockCharts.com. Why? At the end of the day, StockCharts.com has a great free product. It’s easy to use, and simple to read. You’ll be presented with the default daily chart. From there, you’ll notice you can click the time period drop down menu (beside the ticker field) and change it from “Daily” to “Weekly”. Now if you’re looking for fancier charting tools I recommend Yahoo Finance of TradingView. Out of the two Yahoo is my favourite because it has great charts with tons of features and you can use it without signing in. TradingView has a lot of pop-ups that can be frustrating. One final note: People often ask me if I have a weekly chart stock screener. Unfortunately the answer is now. So I just screen for my favourite indicators and then look up the charts on the weekly time frames. Now I know that was a lot to read. So if you’re more of a visual learner, I also wanted to create something for you. That’s why I created the Video below about trading weekly stock charts. It includes the 2 key benefits of trading from weekly charts. And it includes some examples to help illustrate the point. Well, here you go, watch this video to answer any final questions you might have about trading breakouts using weekly stock charts. Cool? Cool. Now, I hope that by now you have all the information you need on why you should trade weekly charts, plus the free online tools to do it. But just in case that’s not enough… well… feel free to keep reading. You can bet that if there’s stock market information of value… chances are… other people have written about it. I hope this article has given you everything you need to know when it comes to using weekly charts for your trading and market analysis. And if you’re still looking for more information on how to build a great trading system, I encourage you to fill out the form below. Get this article as a PDF and receive weekly chart ideas every weekend!